AND THE 50-50 RAFFLE WINNER IS!!!!!! Ron Price is the lucky winner of the $10,000 50/50 draw. “I said I’ll buy $100 worth of tickets and that will be our donation for now,” said Price. Thanks Ron for your generosity! 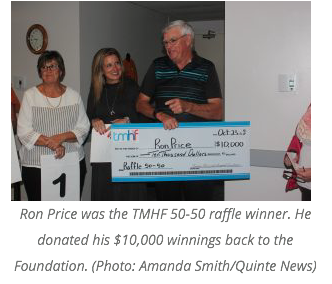 Our purpose is to raise and manage funds in support of the best quality health care that Quinte Health Care – Trenton Memorial Hospital (QHC – TMH) can provide. Since 1983, the TMH Foundation has been working closely alongside the Board of Directors to build strong relationships with our donors. Together we provide you with the opportunity to help your local health care grow by getting involved.